High image quality at minimum bandwidth characterise the future-oriented video solutions of IT-Systemhaus Salzgeber. Using standards like H264/MPEG4/HD, Salzgeber systems consume about 30 percent less bandwidth and up to 50 percent less memory than comparable systems. The high-tech systems of Salzgeber permit transmission of live images starting at as little as 64 kilobits per second. Comprehensive overall solutions technology permits loss-free still recording and storage. The local architecture also minimises the danger of a complete system failure. A control centre solution with open interfaces (ONVIF, Camera Gateway) offers flexibility in the connection of Salzgeber CCTV systems to present or future systems. Well-structured operator interfaces and self-explanatory menus facilitate use and reduce the training time. You will be one step ahead of the future with Salzgeber CCTV systems. Systemhaus Salzgeber has a large number of IP-cameras with HD- and SD-resolution, digital and analogue connection options. All cameras use the state-of-the-art H.264-compression technology. Easy use of HD- and SD-cameras in one and the same network offers users flexible solutions and a great selection of IP-cameras across all price-performance categories: SNZ-standard, IP-dome for the outdoor area, fixed cameras, IP fix-cameras or HD minidome-cameras. Systemhaus Salzgeber has the solution for any requirement. The connection between two sites may be interrupted even with the best networks, particularly in centralised structures with site-comprehensive systems. The local Salzgeber system is not affected by connection interruptions, since it can work independently on site by backup NVRs. 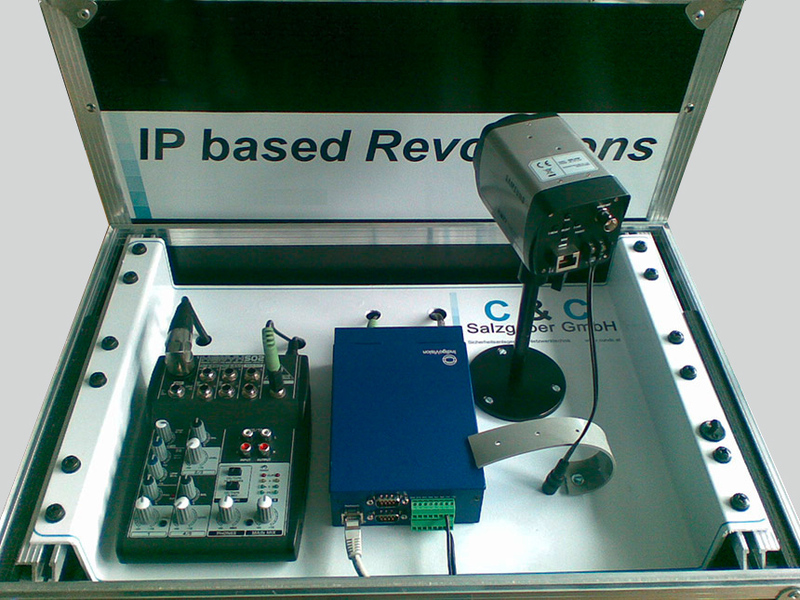 Salzgeber uses high-performance systems for recording and playing back video and audio data of cameras and encoders. Up to 200 cameras can record at the same time at full image frequency and the recordings of up to 20 cameras can be played back in parallel and synchronously on one workplace. Long-term recordings, as they are used in animal research where they will run for two years or more, are no challenge for Salzgeber systems. To protect the environment, all models are designed for the smallest possible power consumption and lowest heat irradiation. The encoder- and decoder-modules by Salzgeber use the leading H.264-or MPEG-4-compression technology. This permits even present analogue surveillance cameras and video screens to be integrated in a state-of-the-art CCTV system and digitalised. Video- and audio systems by Salzgeber transmit streams either via multicast or unicast transmission procedures. This way, the number of addresses does not limit the system architecture. The operating panel keyboard is connected to a PC with Control Center and permits control of all dome-cameras in the IP-network. The virtual matrix of the Control Center permits protocol implementation of many different SNZ-dome and pan-tilt head cameras. This makes CCTV systems by Salzgeber so flexible that cameras of most manufacturers, including Pelco, Panasonic and Philips-Bosch, can be controlled. We record and protect. For your safety. Wearing our FrontLine camera police, public servants, hospital workers and others who deal with the public are protected against abusive behavior, false complaints and litigation. Every incident is seen, heard and recorded.The FrontLine is a tireless witness, working 8-hour shifts without a coffee break, without blinking. It misses nothing. So FrontLine protects their honor, their reputations and peace of mind. Body Worn Video has been proven to reduce aggressive behavior while it demonstrates that staff are following correct processes and procedures, meaning false claims can be dismissed and liabilities reduced.In conjunction with an existing video surveillance infrastructure, the FrontLine gives you, or a courtroom, the complete picture. A powerful, wearable camera is made even more powerful by software that gives full user traceability, evidence management and secure archiving. Get the complete picture: FrontLine is fully integrated with IndigoVision's Control Center delivering a different dimension of safety. A fully integrated user interface for managing video, it puts everything in at your fingertips. Easy to install and intuitive to operate, Control Center gives you sight, sound and oversight of all cameras in your system. See everything, hear everything, track everything. Footage can never accidentally land in the wrong hands or on the internet: To us The FrontLine is not just a camera: it’s a witness protection program. Its evidence protects police, ambulance drivers, nurses and other key workers who interact with the public. It’s also evidence of IndigoVision’s commitment to keeping our customers, whatever their profession, safe. Get the badge. Your Frontliners deserve the right to its protection every day. Video encryption in real-time: Video surveillance shows all security-relevant events, but the persons in the images get pixelated. With this technology privacy is guaranteed and the video data is protected from abuse. The technology of video surveillance used by Salzgeber and developed further in the Systemhaus has already ensured safety at large sports events like the Olympic Games in Turin and Athens and during the soccer World Championship in Germany. The equipment of the Wörthersee stadium for the soccer European Championship 2008 was part of the long list of the Austrian references, as well as the equipment of fan zones, power stations, prisons, security companies, zoos, schools and universities. The Austrian and German IT pros of Salzgeber developed a video management system for the Department of Integrative Zoology of the University of Vienna that is suitable for use in tropical regions to be deployed in the French-Guyana jungles. Evolution biologists Eva- and Max Ringler are researching the survival strategies of poison dart frogs in the North-East of South America. To this end, the researchers from Vienna surveyed a river island of about five hectare, mapped it and released thousands of tadpoles. The frog population, which will be isolated from others of its species, will be monitored with dedicated full-HD audio and video equipment. Heat, 80% humidity and mosquitoes pose great challenges not only to the researchers. The technology must work around the clock at best failure safety and easiest handling as well. "There is no way to repair it. The next village is five hours away by boat," CEO David Salzgeber explains the framework conditions for the development project. The entire control unit, CPU, memory unit and energy supply for the UP-based video management system therefore has been packed in an impact-resilient special case that is water-tight, swims, can be submersed in water and is dust-proof. "Opening the case would mostly endanger the temperature- and moisture-sensitive high-performance lithium ion polymer batteries," Salzgeber continues. All connections for up to three analogue or IP cameras, the charging and storage connections can therefore be accessed from the outside. An additional network plug at the box enables maintenance and setup access. To observe the frog population, three 360-degree dome cameras are used for day- and night operation at a focal width of 3.8 to 122 mm and 55 Watt. In this configuration, the entire system can record up to ten hours at a resolution of 1,920 by 1,080 pixels and 25 frames per second (Full HD). The cameras are supplied with power through special UV-resilient network cables (Power via Ethernet). Since the operating duration of the cameras depends on camera type and zoom strength, the system can be expanded by additional battery cases. The batteries are charged with the case closed in the camp, using a special charger for quick charging and voltage monitoring of the individual energy cells. In addition to successful use in field research, Salzgeber developed the new generation of its high-end CCTV systems for mobile surveillance of industrial facilities. The industrial version has a 230 Volt connection (not required in the jungle) for power supply and an integrated SMS/UMTS unit. Three live connection methods are provided for data transfer in the current version by default. According to the operator's infrastructure, he can use the system's W-LAN-, LAN- or UMTS-signal. 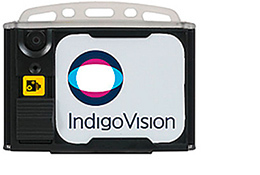 The IndigoVision video codec opens up the mobile CCTV-system for analogue cameras as well. The sabotage alarm system of the unit is new as well. Unauthorized opening of the box will automatically cause it to send a text message or email to a pre-set address. Hundreds of thousands of spectators could enjoy the finals of the 13th soccer European Championships in the Wörthersee stadium in June 2008 without any incidents. A small but essential contribution to this was made by the Salzgeber IT- revolutionaries. 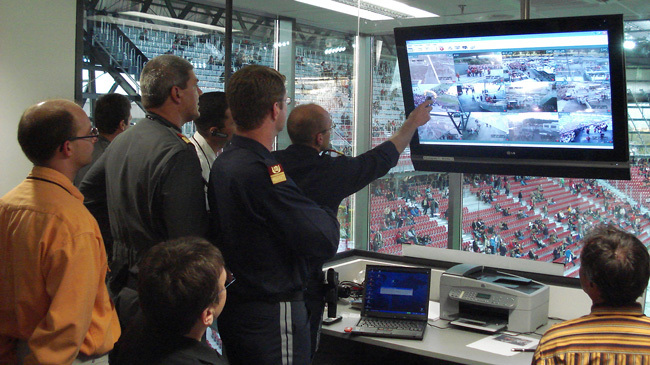 38 controllable and 4 fixed cameras ensure preventive safety in the Klagenfurt stadium. The MPEG4-based video system visualises a dedicated fibreglass backbone right on the control centre screens. The automatic alarm scenarios permit quick reaction to any events in the sectors and zoom the cameras to the crisis points automatically. The remote effect of many power station plants became a more and more difficult subject for the network group. The previous system for power station monitoring is based on the analogue cross-rail technology, which quickly meets its limits in remote transmission, however. The Mellach power station, power stations at the Danube and the power station group Malta were pilot systems for the Salzgeber technology. 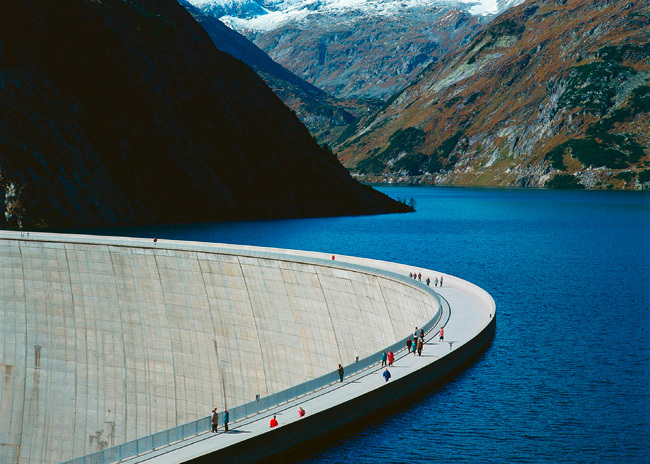 After a comprehensive test phase, Austria's leading electricity company VERBUND relies on the Salzgeber system solutions with its 116 power stations from now on. The University of Vienna, department for neurobiology for behavioural sciences under the management of Univ. Prof. Dr. Ludwig Huber, relies on solutions from Salzgeber in animal research. Researcher Ludwig Huber specialises on the examination of perception and recognition performance of animals. For him and his team, Salzgeber GmbH developed a device to record audio signals (sounds and noises) with highly sensible sound technology and to feed it into the applied video system of the University of Vienna. The strongly scalable audio system makes new insights from animal observation accessible to researchers. The Salzgeber system was connected to the research software of the university to enable the scientists to flexibly work at their research stations later. The recorded audio and video data can thus be processed further in the best fashion. 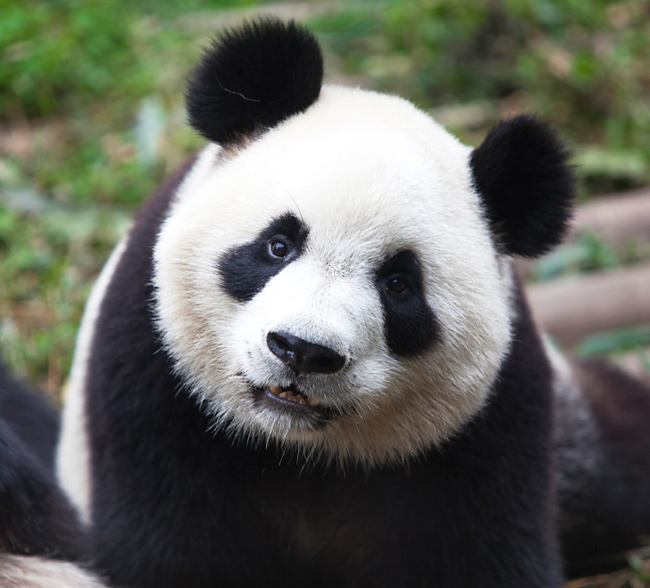 The giant panda and the Indian rhinoceros are some of the rarest mammals on our planet. With the pioneering Salzgeber video and audio technology, the keepers and researchers at the Tiergarten Schönbrunn can watch and listen to the endangered animals around the clock from a central control centre. Fixed and controllable cameras were installed at the enclosures to record the movements of the animals. The Salzgeber technology used permits the researchers to control the cameras in real time. 25 images per second are recorded to analyse the animal movements in detail. 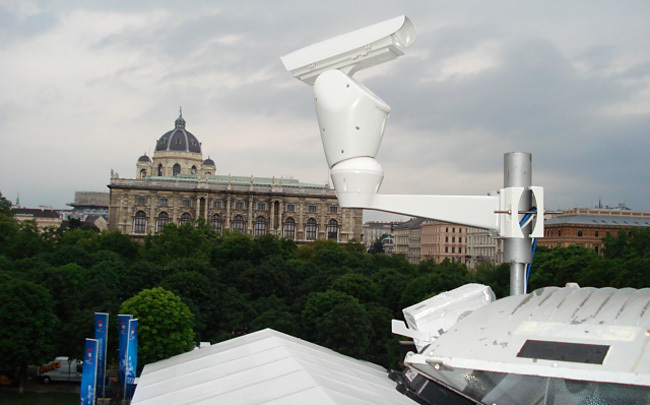 The entire technology of video surveillance in the Tiergarten Schönbrunn was designed and implemented by Systemhaus Salzgeber. The video coders are integrated into the present LAN-infrastructure of the Tiergarten. Currently, more than 100 cameras are used at the Tiergarten Schönbrunn, with the latest generation already transmitting in the HD‑standard. Hundreds of thousands of fans on the fan fests in Vienna, Salzburg, Innsbruck and Klagenfurt were able to feel safe because of the sophisticated video system by Salzgeber. The safety authorities of the cities of Vienna, Salzburg, Klagenfurt and Innsbruck relied on the IP-based video surveillance by Salzgeber. The controllable video surveillance cameras in the fan fest of the city of Klagenfurt and in the fan zone of the city of Salzburg are triggered by radio and encrypted radio link. Due to the high compression rate (H264/MPEG4/HD and MPEG4 standard) as well as the low latency times, not only the central control centre but also disaster protection of the state of Salzburg can provide a master image across an also-encrypted line as well. The Innsbruck fan zone at the Bergisel and the fan fest Vienna from the Rathausplatz to the Heldentor were also equipped with the high-tech system by Salzgeber. 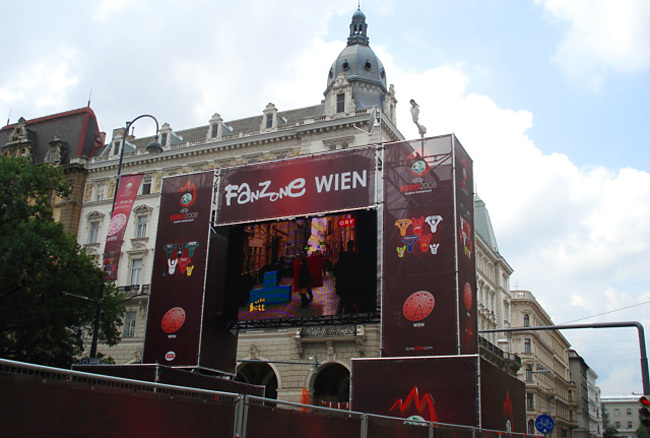 A fibreglass-backbone was set up in Vienna. Cameras outside of this backbone were connected by radio. 17 cameras with strongly zoomable lenses were used for monitoring of all entrance areas to support the security staff. The camera images were presented on plasma screens in the central control centre. Another fibreglass equipment provided by Salzgeber supplies TV signals to the LED walls of the fan zone. 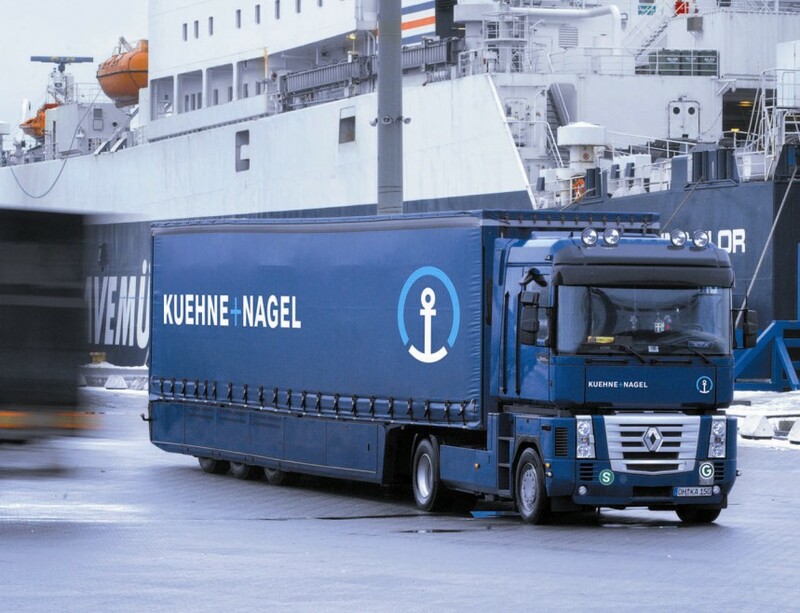 With more than 1,000 branches in more than 100 countries and with more than 63,000 employees, Kühne+Nagel, a company founded in Bremen, Germany in 1890 is one of the globally leading logistics providers. It is very important for the persons responsible at Kühne+Nagel to be able to monitor all branches from a central control centre by video transmission with best image quality. The entire technology of video monitoring for all five Austrian companies was designed and implemented by Vienna high-tech company Salzgeber. The flexibility in the control logs permitted use of the present analogue cameras and the present LAN-infrastructure of the company. The specifications were quickly and cost-efficiently implemented and do not prevent expansion of the video systems at a later time either. Additionally, the system meets the high safety requirements of a leading branded article manufacturer for storage of his goods. All activities within and outside of the storage sites currently can be viewed at any time. A fully automatic scan of the vehicles that bring in and take away deliveries by the system and the gap-less documentation of loading and unloading are an essential quality feature of the system.